Shanti Hiranand was born in a business family in Lucknow. Her love for music goes back to her childhood. Soon it became an all consuming passion for her. 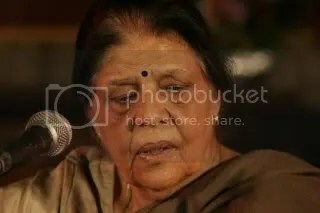 Starting her early training at the Music College in Lucknow, she had to shift to Lahore in the early 1940s because of her father’s business interests. Her first performance was on Radio Lahore in 1947. After the partition her family shifted back to Lucknow and she started training under Ustad Aijaz Hussain Khan of Rampur. Alongside she continued performing on AIR. She met her guru, guide and mentor in Begum Akhtar in 1957. Begum Akhtar already had two excellent ganda-bandh (officially accepted and initiated) shagirds, or pupils, Rita Ganguly and Anjali Banerjee. From reading Shanti Hiranand’s biography of her guru, ‘Begum Akhtar: The Story of My Ammi’, one gets the impression that she was the only student who mattered. Begum Akhtar trained her in the traditional forms of thumri, dadra and ghazal singing. Begum Akhtar’s passing away in 1974 drove her to dedicate her entire efforts to excel in the art given to her by her guru. It is interesting how these two women from seemingly diverse backgrounds could come to such an exalted level of understanding between themselves, in times that were not very conducive to such social interactions. Shanti Hiranand belonged to an upper middle-class business family. She had a liberal education and was used to a certain space and freedom to pursue her own passions, while Begum Akhtar lived within the cloistered environs of a typical feudal home in those days. While Shanti Hiranand was an austere Gandhian, Begum Akhtar was a person of deep indulgences. It is amazing that even Shanti’s parents never stood in her way, they never stopped her from being with her Ammi. On the contrary on occasions it was Shanti’s mother who encouraged her to follow her guru right until the end. Shanti Hiranand also acted in films. She played Siddhartha’s (Shashi Kapoor) mother in Conrad Rooks’ 1972 English movie Siddhartha. Please open an account on mediafire.com or any other file hosting site and upload the songs. I can then download from there. There is no way to upload songs directly on Indian Raga. i love your voice much than others. i am studying. if i will get a chance to learn a music i will sure to choose u as my teacher. Reblogged this on Music = harmony with God.